I grew up near Yosemite, so I’ve seen many changes in this park over the years. 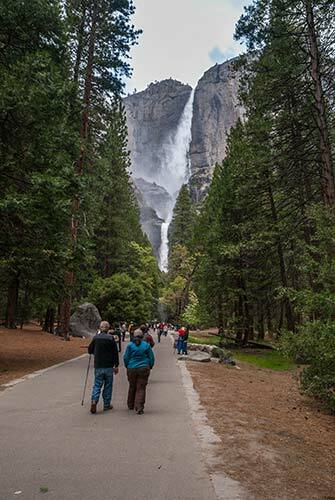 One of the biggest access improvements was the 2005 Yosemite Falls trail project. Previously you had to be able to negotiate a steep, slick trail in order to get a close-up view of Lower Yosemite Falls. Today, the original footprint of that trail still exists on the west side of the falls, but there’s also a new 3/4-mile paved trail on the east side. It leads from the shuttle bus stop to the base of Lower Yosemite Falls, and the gentle grade allows for easy wheelchair access. As an added bonus, this wide trail has many pull outs, resting spots and benches along the way. It’s such a special treat to feel the spray from the falls on your face, and I’m happy that everyone can now experience this sensation. It’s also an awesome photo opportunity in late spring, when the falls are at their peak. 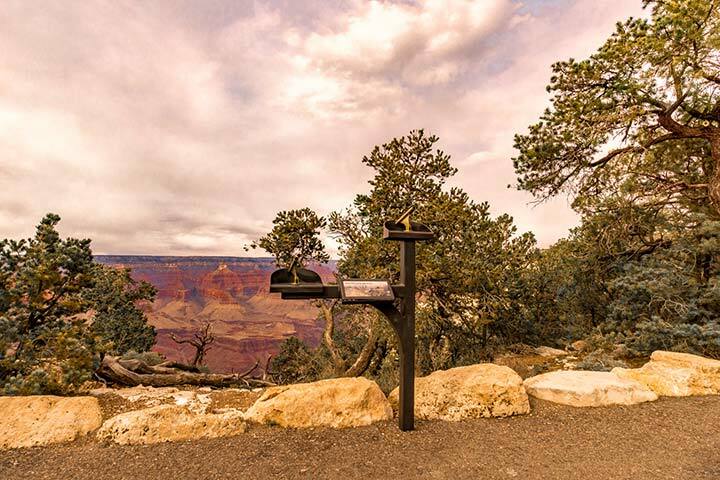 There’s no shortage of accessible trails at the Grand Canyon, and two of them are easily accessed from Verkamp’s Visitor Center, located right on the rim. If you turn left, the half-mile Rim Trail passes in front of Hopi House, the El Tovar Hotel, Kachina Lodge, Thunderbird Lodge, the Arizona Room and Bright Angel Lodge, with stunning canyon views along the way. The trail is wide, level, paved and very accessible; in fact, it’s more like a large sidewalk in front of the hotels. Once you hit Lookout Studio, the trail loses it’s access, so you’ll have to double back. And of course you can stop for a break along the way, and do as little or as much of the trail as you want. If you take a right turn from Verkamp’s Visitor Center, the 1.3-mile Trail of Time takes you up to the Yavapai Geology Museum. The paved level trail winds along the rim of the canyon and helps visitors understand the magnitude of geologic time. The geologic timeline is marked by brass medallions embedded in the pavement; and interpretive exhibits and displays along the way encourage visitors to connect the visible rocks in the canyon to the geologic timeline. Wheelchair-height viewing scopes are available, and accessible pictograms point out the wheelchair-accessible route. Up in Olympic National Park, the Moments in Time Trail runs through a secluded forest and along the shore of Lake Crescent. This .6-mile loop trail is comprised of hard-packed dirt covered with crushed granite; and outside of a few roots here and there, it’s nicely accessible. This easy trail winds through the forest and includes plaques with reflective quotes, so visitors can “reflect in this moment in time”. 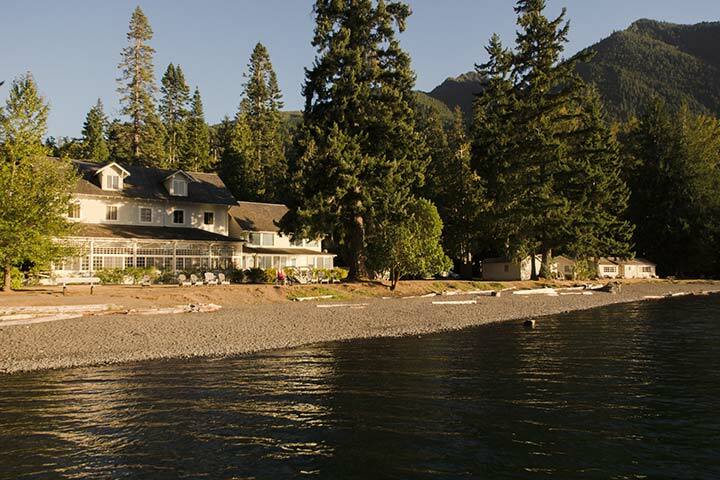 And if you’d like to do a little more reflection, then head on over to the main building at Lake Crescent Lodge, and enjoy the view from the glassed-in porch at sunset. They offer a nice menu of appetizers and adult beverages, and even though it is a historic building, ramp access has been added. Additionally they have some very nice accessible rooms with excellent views of the lake. It’s the perfect place to relax, unwind and enjoy Mother Nature’s beauty. Nothing beats a drive through Zion Canyon, and although no cars are permitted past Zion Lodge, there is free shuttle bus transportation up and down the Canyon. The buses are all wheelchair-accessible, and there are several accessible sites along the way. And although most folks are aware of the shuttle bus service, they haven’t a clue that there are also free ranger-led shuttle bus tours. 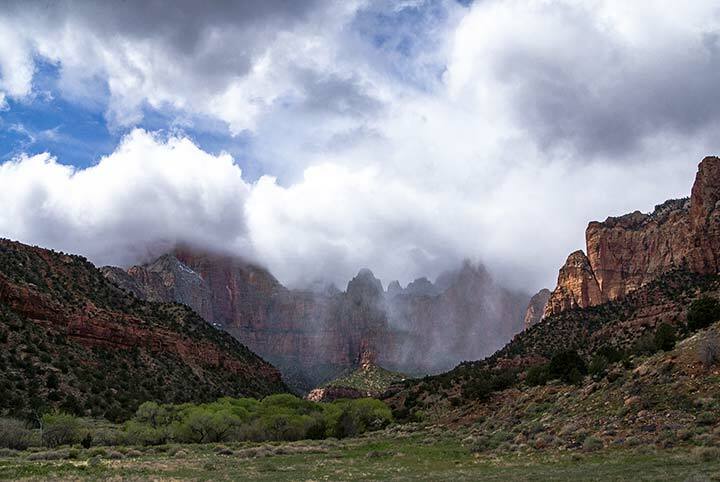 The 90-minute tours depart from the Zion Canyon Visitor Center at 9:00 A.M. and 6:30 P.M. There are several stops along the way, as the ranger offers an interesting commentary on the canyon. Although there is no charge for the tour, advance reservations are required. They can be made up to three days in advance at the information desk at the Zion Canyon Visitor Center. Telephone reservations are not accepted for this tour, and the group size is limited to eight people per party. It’s a great tour, and one that a lot of travelers overlook, so make plans early to get your seat on the bus. And yes, the buses feature lift access with wheelchair-tie-downs. Last but not least, I can’t leave Old Faithful off the list. There’s a barrier-free boardwalk from the visitor center over to the iconic geyser. From there a .7-mile boardwalk and asphalt trail winds around the geyser, and althoughit’s not entirely level, it’s doable for most people. If you can’t do distances, the visitors center also has a few loaner wheelchairs. Seating for eruptions is on benches near the front part of the boardwalk. The best option for wheelchair-users is to roll up to the front, so that people standing up for the show won’t obstruct your view. All in all there’s plenty of seating, so it’s easy to snag a first row bench so your whole party can enjoy the show together. 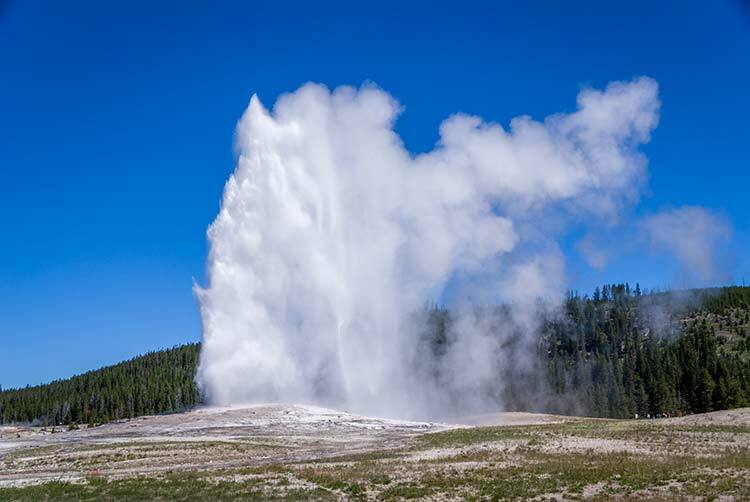 And what a show it is, as Old Faithful spews forth boiling water which rockets to an average height of 130 feet, approximately 17 times a day. Plan ahead, and check for the next eruption time at the visitor center, as the eruptions are approximately 90 minutes apart. Hopefully this list has inspired you to check out our national parks, as they really are for everyone. And if this isn’t enough of an incentive, then maybe you can be bribed with free admission. That’s right, if you don’t happen to have an Access Pass (and you should if you are permanently disabled), you can still get free admission to our national parks on August 25 — in honor of the NPS anniversary. So go ahead, get out there and enjoy these beautiful — and accessible — public lands! This entry was posted in Discounts & Freebies, Great Outdoors, On The Cheap, Recreation, Road Trips and tagged Access Pass, free, Grand Canyon, National Parks, Olympic, wheelchair, Yellowstone, Yosemite, Zion by Candy B. Harrington. Bookmark the permalink.